199X Dispatch brings you the latest news on my progress through the Game Club 199X game(s) of the month. This month's games are Wonder Boy in Monster Land (SMS) and Dragon's Curse (TG16). See that red tadpole in a loincloth? I'm gonna kill it. I spent my last lunch break and the better part of Sunday afternoon beating up sunflowers in a desert. Why? I want stones. What are stones? I'm not sure, but for some reason they raise my "CP," which for some reason makes shopkeepers more interested in taking my money. Money, itself, comes very cheap. That's how things work in Monster World. Whereas Wonder Boy in Monster Land was all about the making money appear out of thin air, Wonder Boy III is about charm. In this game, I have more than enough money to buy just about anything, as every other enemy drops a giant sack of Monster-Nickels. Pretty tough looking. Except for that neckerchief. The tedium of grinding is exacerbated by the game's transformation feature, which is as frustrating as it is clever. The wacky power ranger dragon-bot from the end of Monster Land, with its dying breath, cast the titular "curse" cast upon our hero, transforming him into a dragon. The hero must fight his way through a series of bosses, clawing his way back up to reclaim his human form, species by species. Although there is a way to change back into previous forms, in the early part of the game you are stuck as whatever you are. My problem is that, in rushing through the last transmogrification (the tiny, round-eared lawsuit bait "Mouse-Man") I neglected to buy any stat-boosting gear. Now, as the hulking Piranha-Man, I can no longer reach those shops. It's like locking myself out of my apartment. Which I totally never do. compared to being draped in what I presume is chain-woven goblin flesh. This is bad. Armor and shields can boost various stats, as with many RPG-ish games. 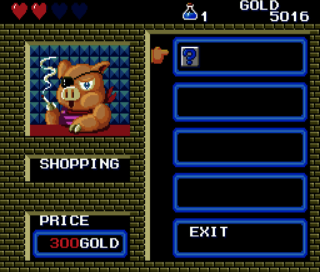 One of those stats in Dragon's Trap/Curse is "charm," which has no effect other than making shopkeepers more willing to part with useful swag. Since I did not buy the "Dancing Shield" or some other nonsense, I now need to grind for charm-enhancing stones until I'm friendly enough to buy a vital set of armor. Without which, I cannot cross this vast lava field between me and the next objective. The game is quite generous with healing items. 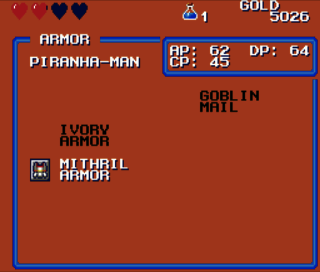 If you're low on health, dead enemies are far more likely to relinquish hearts, big and little, as well as potions, which breath life back into our hero when he runs out of HP, just like the reserve tanks in Super Metroid. But there seems to be no reliable way of grinding for those little red stones. And thus, I am left to wander this desert, whacking snakes over the head, collecting rocks. If you'll excuse me, I just raised my CP stat by another two points. Time to check if the one-eyed pig-man wants my money yet. Well, if you need CP you can always just save, restore and revisit treasure chests, which refill when you restore. 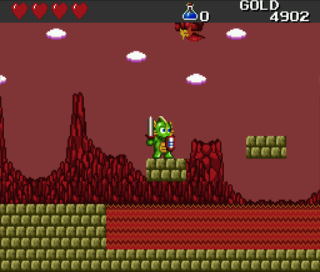 Once you get right sword, you can get several stones at a time from a hidden chest in the desert. You should be able to do this with the fishman. I didn't know the chests refilled. I don't think I ever bothered to check ones I'd already gotten, actually. The CP poverty ended up being a nonissue shortly after writing this, though. One of the blue ant lions in the lava dropped dragon armor -- how thoughtful. Where is this hidden chest of which you speak? If you have the brick-breaking sword, climb over the top of the pyramid and enter the sphinx. Break the walls and fall down to the treasure room. Each chest have like 8 items and you can open one chest each time you enter the room. Just enter and exit, jumping over chests until you reach the last. I think that's the one that has stones in it. There's also a trick wall near the end of the pyramid dungeon (if you jump over the final pit). And a trick ceiling above that same pit. I forget just what their treasures are, but there might have been a potion or two. The reason for the blog is that we're playing this game for the Game Club 199X podcast, and just growsing a bit about some of its mechanics.